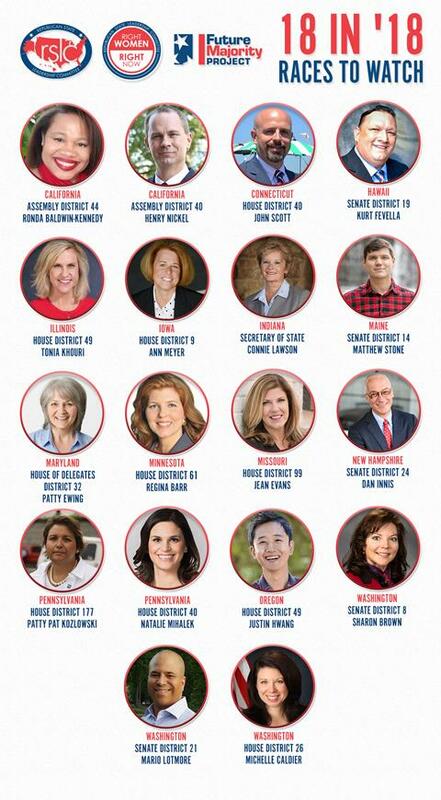 The RSLC released its final “18 in ’18: Races to Watch” list this afternoon featuring female, diverse, and gay down-ballot Republican candidates. In total, the RSLC has featured 90 candidates engaged with the Future Majority Project and the Right Women, Right Now initiatives who are running in competitive down-ballot elections in 2018. “Government needs individuals with a diversity of backgrounds, life experiences, and skills to address the great challenges we all face together, and these outstanding candidates embody the mission of the Future Majority Project (FMP) and Right Women, Right Now (RWRN) initiatives,” RSLC President Matt Walter said alongside the release of the final edition. The RSLC launched multiple independent expenditures in Nevada this week including campaigns supporting Secretary of State Barbara Cegavske and a pair of Assembly candidates. Additionally, the RSLC began running a six-figure digital campaign hitting Democrat lieutenant governor candidate Kate Marshall over her mismanagement of state taxpayers’ money during her tenure as State Treasurer. “Liberal Kate Marshall has abused the trust given to her by Nevadans by squandering millions of taxpayer dollars to increase her own office spending, and mismanaging millions in scholarship funding,” RSLC President Matt Walter said upon the release of the campaign. On Tuesday, the RSLC began running a television commercial promoting Wisconsin Lieutenant Governor Rebecca Kleefisch’s commitment to protecting health care for individuals with pre-existing conditions. Kleefisch, herself a cancer survivor, and Governor Scott Walker have been forcefully pushing back against Democrat attack ads on covering individuals with pre-existing conditions in the final weeks of the campaign. In an interview with the Wall Street Journal‘s Capital Journal newsletter, RSLC President Matt Walter said of the political environment, “What we’re seeing out there is more of a ripple than a wave.” He went on to suggest that any Democrat gains this cycle will “be nowhere near what Republicans accomplished in 2010.” In another interview previewing state legislative elections, Walter suggested the strong economy will help Republican candidates running in competitive races and suggested Republicans could make gains in state legislatures in traditionally blue states like Connecticut. In conjunction with the RSLC’s Future Majority Project, the RSLC announced a statewide bilingual digital campaign in support of Illinois Lt. Governor Evelyn Sanguinetti and Governor Bruce Rauner. Sanguinetti became the first female Hispanic lieutenant governor in the country when she and Rauner were elected in 2014. “Lt. Governor Sanguinetti has proven herself invaluable to Governor Rauner’s efforts to reform education and bring back over 200,000 jobs to Illinois,” RSLC President Matt Walter said in the press release announcing the campaign.